"My name is Doug Carty and I am the Outdoor Recreation Coordinator at Franklin Pierce College. It comes as an odd coincidence that you e-mail us about our lost ski hill just as I am petitioning to reopen them. I actually meet with senior staff tomorrow. 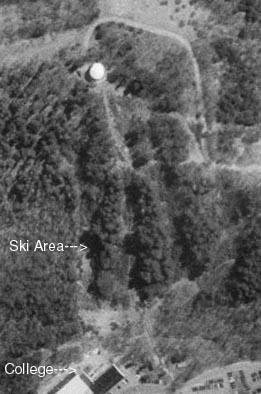 A little bit about the ski hill; it used to have 3 runs, one of them being a ski jump. On your overhead photo the ski jump was furthest to the left. As I am new to the college this year, I have limited info on the runs themselves. I know that they haven't seen use in at least 10 years. The building which housed the rope tow still exists with the old machinery and all! (I wonder if it still will run) I have old architectural drawing which include the trails. At the base of the hill and slightly up the other side is a ski hut we now call the outing hut. 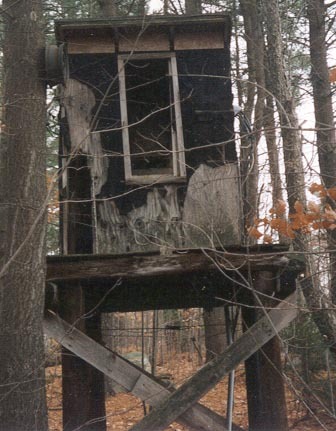 FPC students built the hut back in the seventies I believe." John Tyler contacted us with even more info: What I remember about the hill was that it was fairly step with a western exposure. The students at the college and some local skiers ran a race program for kids. I was a regular skier at Temple Mt, but they did not let 6 year olds race. So I joined the FPC Ski team in 1971. My coach was "Potsie". I was so young and did not get how to go around the gates that they gave me home work. I had to draw a line through the paper race course. The league we raced in was in Southern NH we raced at Fitzwilliam, Pinnacle, Temple, Onset/Bobcat. I did find the area on Terraserver. Looks fairly big, several trails, and probably just a rope tow. Its located right on the campus of Franklin Pierce College. from Chris Lundquist (2001) Dr. Owen R. Houghton, Dean of Students 1975-1990, has some great info as well: I was Dean of Students and an active skier beginning in 1975 - responsible for the Outdoor Recreation program and operation of the ski tow...in the development of the program we relied on the advice of Bill Currier and Dan Leary, who for a number of years has contracted to maintain the cross-country trail network around the campus (at one time 3 separate 5K courses). The ski area consisted of three open slopes to the south of the tow and jump area, used for a variety of winter activities beyond alpine skiing - traying with dining hall equipment being a favorite. And I can still remember the trip downhill my two young sons took with several students in an old aluminum canoe! We were forced to close the area after several warm and snowless years, and most specifically after the famous multi-million dollar Stratton Mt. suit sent our insurance premiums from $200 to $4000. The area now is pretty much back to a natural state with lots of slash but the Outing Club House, built as a January alternative project on the old 4-1-4 curriculum using native pine hauled by horses from the Meetinghouse School and hand-hewed by students, is very much in use. I am delighted at renewed interest at the college in recapturing the benefits of this outdoor recreation space. 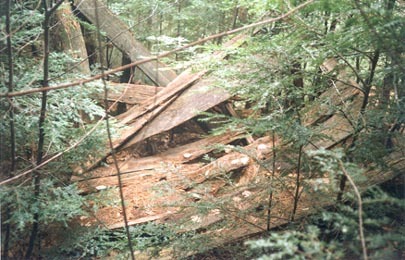 The remains of the old jump at Franklin Pierce. From Chris Lundquist. Mike Iacopino: During the winter of 1976 - 77 I skied for the FPC ski team. We used the trails at the college for some of our training but most of our training took place at the Onset Ski Area. Nonetheless that winter was exceptional for the quantity and quality of snow. I have fond memories of our entire team sneaking out to the ski jump one evening and flying off of it on a tobaggon. We got in big trouble and the next mornng we had to go out to repair the out run by sidestepping the ruts out. We also had a wild winter carnival that winter where the slopes were used extensively. My favorite event was the beer slalon which had kegs of beer located at strategic locations along the course which were designated as mandatory refreshment in order to complete the course! I also remember that there was an excellent cross country trail system which looped out behind the ski area and if one wanted to they could pop out to the ski area and ski down the trail to the base of the rope tow. This was pretty challenging on cross country skis as the slopes did have a good pitch. Tom Hess: I also skied at the Franklin Pierce area during this time (1979-1983). Since the area had no snowmaking, you can imagine that it was rarely open. As I recall - we skied the are during the 1981-82 winter once for a few days during January. There was no grooming of any kind, so it was "skiing as it used to be" to say the least. The ski lodge at the area was actually a student project for January Interim Session, and I believe was built during January of 1980. Do you have further info on this area? If so, just let us know.